Of all the animals to encounter in a tropical rainforest, amphibians and reptiles are often a favorite find. From showy lizards to leaf-like frogs, shy turtles to pencil-thin snakes, this group of animals fascinates many. In the lowlands and foothills of Central Panama, dozens of species of frogs, lizards, snakes and other herpetofauna exhibit a dazzling array of life-history traits as they adapt to a wide variety of habitats. Many species are most active at night, when the forest becomes alive with the calls of frogs, toads and other nocturnal creatures. Their unique behaviors and attractive coloration impress even the most skeptical. Join us at the Canopy Tower and Canopy Lodge for this exciting reptile and amphibian tour focused on these vertebrates and their amazing natural histories! For this exciting 8-night amphibian and reptile tour, herpetologist Dr. Stephen Mullin will join our bilingual naturalist guides. Steve is the Chair of the Department of Biology at Stephen F. Austin State University and Editor of Herpetologica, an international scientific journal specializing in reptiles and amphibians. He has been involved in herpetology surveys in tropical America, and is the lead instructor for a field herpetology workshop hosted at the Southwest Research Station in Arizona. Now, Steve brings his passion, knowledge and enthusiasm for amphibians and reptiles to us! Join Steve and Canopy Family’s naturalist guides for an unforgettable reptile and amphibian tour in search of an array of Panamanian reptiles and amphibians! We will visit some of our premier areas for wildlife watching during the day, and conclude several days with night hikes, when many of these animals are very active. Steve brings his knowledge and expertise to this exciting program on our daily walks, and will deliver informative presentations regarding the natural history, ecology and conservation of tropical reptiles and amphibians. By maximizing our opportunities for exploration, we will no doubt find many interesting representatives of these two groups of animals! 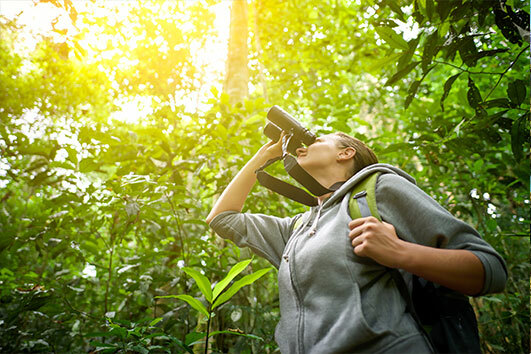 There are also ample opportunities to enjoy the birds, mammals, invertebrates, and plant life of the rainforests! Please note: This amphibian and reptile tour focuses on an introduction to the amphibians and reptiles of Panama, their natural history, ecology and conservation. Absolutely no private collecting of any specimens will be allowed. Rate is US$ per person (+ taxes), double occupancy. This all-inclusive herpetology tour includes lodging and meals at the Canopy Tower and Canopy Lodge, bilingual professional guides, WiFi, wine with dinner, airport transfers to and from Panama City and all tours and presentations as per the itinerary. Please check with our reservations office for the times of our scheduled airport transfers to coordinate your arrival and departure times. This amphibian and reptile tour does not include flights to and from Panama City, all taxes, private airport transfers, tips and alcoholic beverages. Welcome to Panama! Once you clear customs, you will be met by our driver and shuttled through the urban jungle of Panama City to the Canopy Tower Eco-lodge. The Canopy Tower is surrounded by 22,000 hectares of lowland tropical rainforest of Soberania National Park, adjacent to the Panama Canal and mighty Chagres River, the perfect setting for seeking out Panama’s fascinating amphibians and reptiles! As everyone arrives throughout the afternoon, feel free to enjoy the 360° view of the rainforest canopy from the Observation Deck. The view from the top is priceless! Green Iguanas may be seen basking in the treetops and if lucky, a Berthold’s Bush Anole (Canopy Lizard) with a tail 3 times the length of its body, might be seen. As the sun sets, we will meet as a group in the 3rd floor lounge of the Canopy Tower for cocktails and appetizers. At this time, Steve and our guides will provide an orientation and expectations for the week to come. During cocktail hour, Steve will also present some information and an introduction to reptiles and amphibians of the rainforest. Dinner will be served in the canopy-level dining room. After dinner, we will grab our headlamps and flashlights and explore the grounds of the Canopy Tower and Semaphore Hill Road, the access road to the Canopy Tower. The jungle comes alive at night, and we will scan for frogs, snakes and lizards in the foliage of the forest. Tungara Frogs will no doubt be calling from the ditches and temporary puddles, especially if it has been raining. Savage’s Thin-toed Foam Frog, Cane Toads (they are native here! ), and snakes (including Blunt-headed Treesnakes and Terciopelos) are also hopeful finds for this evening’s walk, among many others. Back at the Tower, relax and fall asleep to the sounds of frogs, crickets, and owls in the surrounding jungle. The early morning at the Canopy Tower is beautiful and worth being up on the Observation Deck to see the clouds lift and sun rise over the vast landscape of central Panama. For those interested, the forest canopy is very active with birds in these early hours. Keel-billed Toucan, Red-lored and Mealy parrots, Green Honeycreeper, Golden-hooded Tanager and many others can be seen easily from the platform. Green Iguanas are often seen soaking up the sun’s heat on top of the canopy at this time. 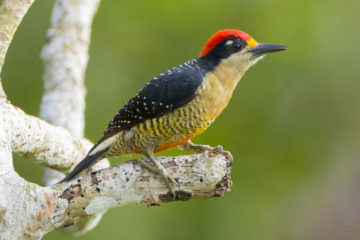 After breakfast, we will continue the amphibian and reptile tour at the hummingbird feeders in the parking lot, where we may see Yellow-headed Geckos running around the concrete culverts at the base of the Tower, then head out for our morning walk down Semaphore Hill Road. 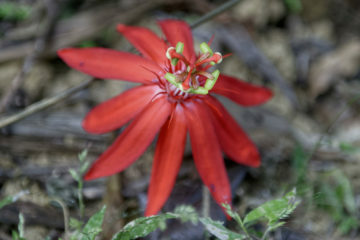 As we walk down the hill, this time during daylight hours, we hope to find South American Common Toads, Green-and-black Dart Frogs, Brown Vine Snakes, Common Bird-eating Snakes, Slender Anoles, Neotropical Green Anoles, Central American Coral Snakes, Centipede-eating Snakes and other diurnal herpetofauna. This road is also great for seeing birds and mammals. We will return to the Canopy Tower at midday in time for lunch. Lunch at CANOPY TOWER. After a satisfying lunch, there is plenty of time to relax – browse the books in the Canopy Tower library, review this morning’s photos or take a siesta – before heading out again this afternoon. 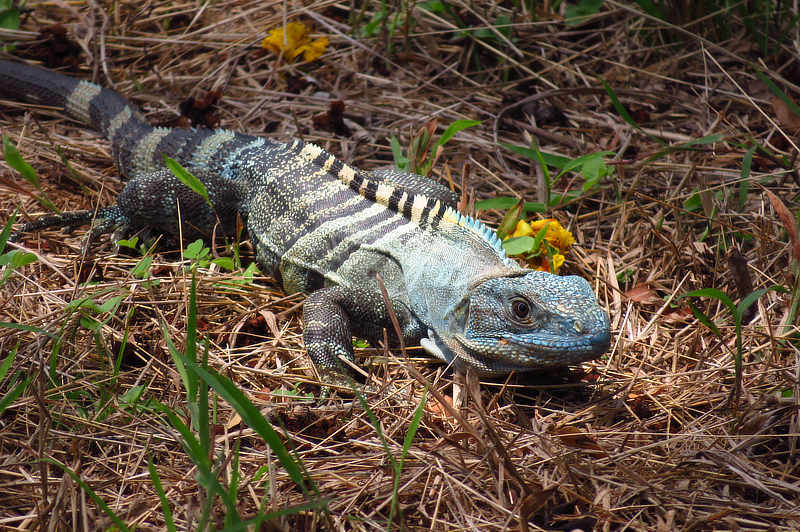 Be sure to keep any eye out the windows, as Green Iguanas are often seen in the treetops! We will meet again and visit the Ammo Dump Ponds, an open lagoon along the Panama Canal at the town of Gamboa. This large lagoon is home to American Crocodile, which we may see swimming in the pond. Black Spiny-tailed Iguanas have been seen here, eating fallen fruits from the Nance tree. We will watch the dry grasses around the edges for Central American Mabuya, Central American Whiptail Lizards and other reptiles. As dusk approaches, we will head back to the Canopy Tower to freshen up before dinner. Dinner at CANOPY TOWER. After dinner, we will take a short drive to Plantation Road. This trail is promising for many species of reptiles and amphibians, both day and night. This evening, we will hope for frogs and snakes! 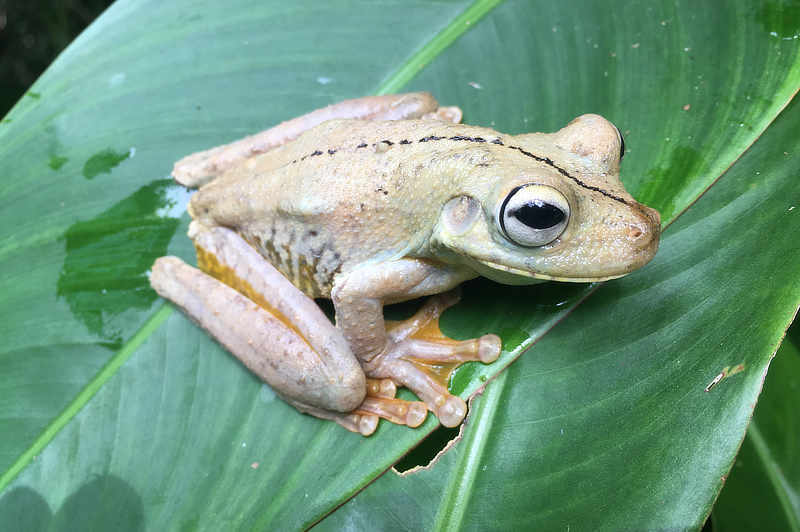 Tungara Frogs might be seen laying their eggs in the puddles along the road, and other possible sightings include Yellow-spotted Night Lizard, Pug-nosed Treefrogs, Red-eyed Treefrogs, Slender Anoles, Mussuranas and Northern Cat-eyed Snakes. After our reptile and amphibian tour, we will head back up to the Canopy Tower for a good night’s sleep. After breakfast this morning, we will continue the reptile and amphibian tour by exploring the incredible biodiversity of the world famous Pipeline Road! Originally constructed as an access road to service a pipeline across the isthmus during WWII, this road is now surrounded by lush, mature secondary forest, and is one of the premier wildlife viewing and scientific investigation sites in all of the Americas. This morning we will walk the gravel and dirt road in search of Central American and Delicate whiptails, Parrot Snakes, Tiger Rat Snakes, Speckled Racers, various species of anoles, Green-and-black Dart Frogs and Rainforest Rocket Frogs in nearby streams. Along the streams, we will hope to see Spectacled Caimans, Common Basilisks and Meso-American Sliders. If we are lucky, we might encounter Boa Constrictors along the road or streamside, or Helmeted Iguanas resting quietly on tree trunks. Speckled Worm Lizards have even been spotted here! After our morning along Pipeline Road, we will head back for lunch at the CANOPY TOWER. After a hearty lunch and some rest, we will head back out on our amphibian and reptile tour and visit the Summit Ponds, another great site not far from the Canopy Tower. The two forest lagoons at Summit are bordered by forest and shrubbery, and is a great place to find some aquatic reptiles including a second chance for American Crocodiles, Spectacled Caimans, and Common and Striped basilisks, along with Black River Turtles and Meso-American Sliders. Along the adjacent Old Gamboa Road, a dry grassy area is another great place to look for whiptail lizards, anoles and other reptiles. This evening, during cocktail hour, Steve will provide us an informative talk about some of the ecological aspects of tropical herpetofauna, particularly, “Tetrapods dealing without,” a look at the loss of limbs and lungs in some groups of amphibians and reptiles. Dinner at CANOPY TOWER. Tonight’s night walk is an exciting one, as we will revisit Pipeline Road and its numerous streams in search for night-active amphibians and reptiles. Along the streams and their banks, we will look for Savage’s Thin-toed Foam Frogs, various species of rain frogs, Red-eyed Treefrogs, Masked Treefrogs, Milk Frogs and impressive Rosenberg’s Treefrogs. 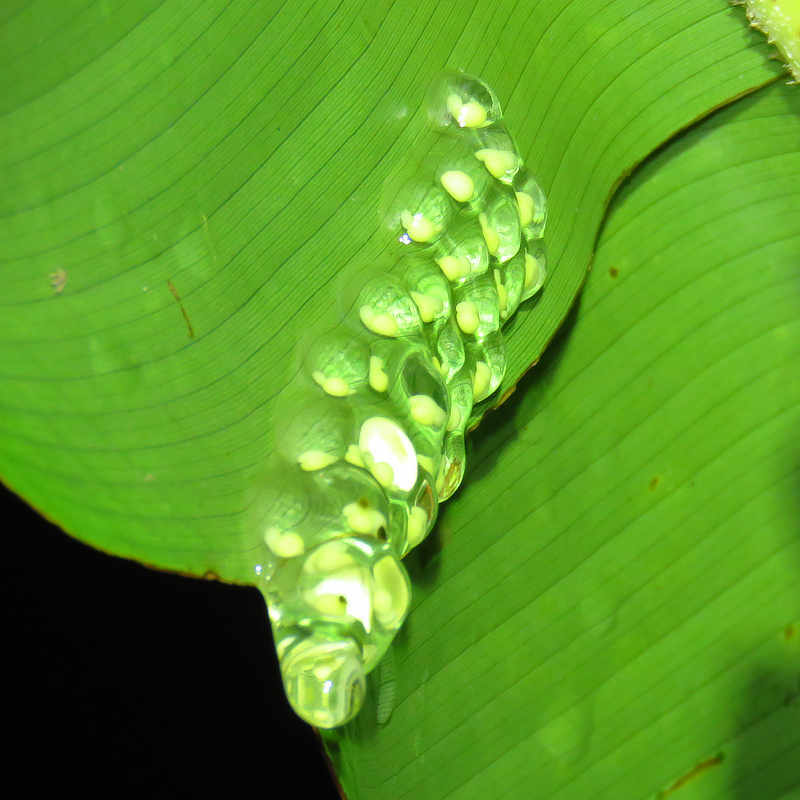 On leaves overhanging the stream we may see egg masses being guarded by Glass Frogs. Cat-eyed Snakes, Terciopelos and other snakes might also be found along the streams. We hope to find many species here! We will awake once again with the roar of the Mantled Howler Monkeys from the treetops not too far away. After breakfast, we will visit Plantation Road again, this time during the day to see what we can find. Plantation Road is a forest trail through the southern part of the national park, where its very tall canopy creates a fairly open understory, and a cascading stream winds alongside the trail for most of its length. It is named for the plantations of cacao, coffee and rubber trees that were located along the road and run by the Panama Canal Company in the last century. Along the road, we hope to find Green-and-black Dart Frogs. At various stream accesses, we can search for glass frogs, anoles, basilisk lizards and snakes. 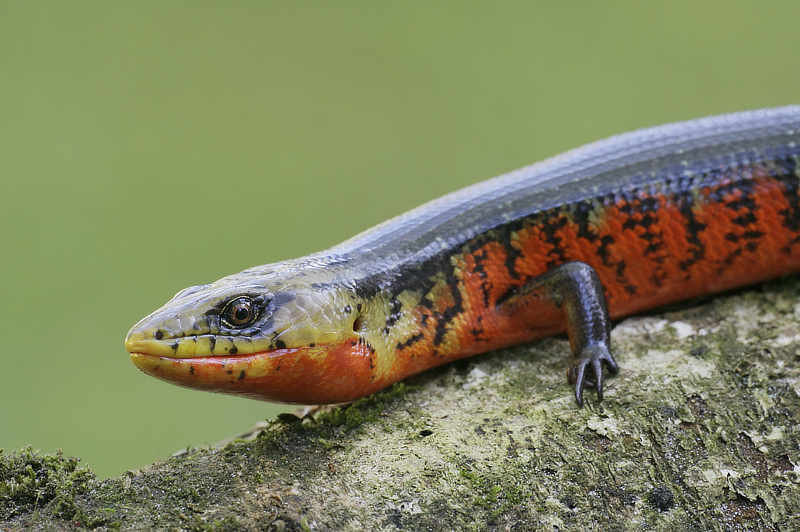 This trail is a great place for finding many reptiles and amphibians, both day and night! Lunch at CANOPY TOWER. This afternoon we will visit the Gamboa area along the banks of the mighty Chagres River! 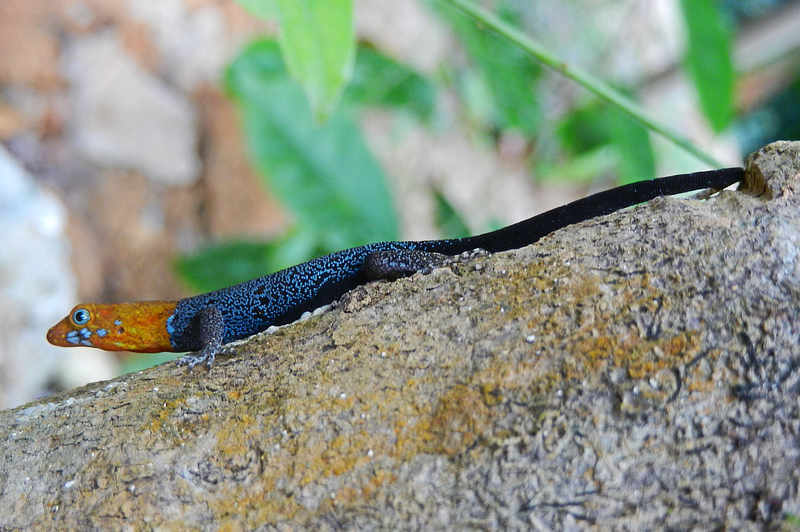 We will spend our time exploring the areas behind the resort, where Giant Ameivas (a type of whiptail lizard) are commonly seen near the exhibitions. We will scan for more crocodile and caiman activity along the river’s edge. We will also visit the recently opened “Tierra de Ranas” display, featuring a beautiful and calming epiphytic habitat for poison dart frogs. 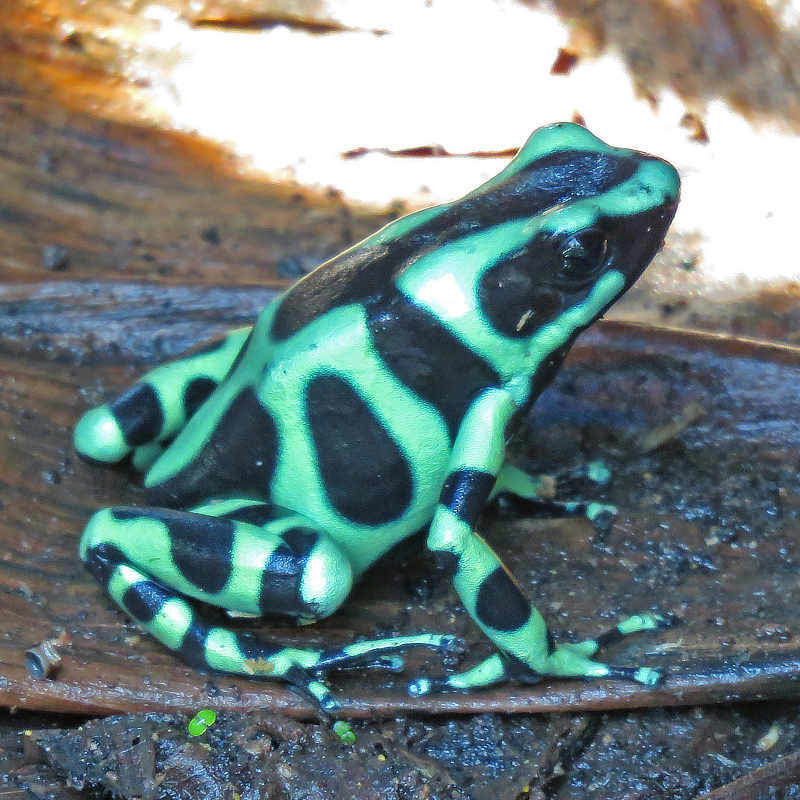 This exhibit features Green-and-black Dart Frogs typical of central Panama, and the variably-colored Strawberry Dart Frogs (Oophaga pumilio) of the western Caribbean side of Panama. This display offers great viewing and photography opportunities to see these tiny amphibians up close! We will return back to the Canopy Tower for cocktails and dinner. Dinner at CANOPY TOWER. This is our final night at the Tower, so for those interested we can once again venture down Semaphore Hill Road and/or Plantation Road in search of snakes, frogs and other night reptiles and amphibians. This morning we will enjoy breakfast and views from the Canopy Tower at a leisurely pace. We will pack and by mid-morning, load up our gear and say good-bye to the Tower as we head over to the Canopy Lodge in El Valle de Anton, 2 hours west of the Panama Canal. El Valle is located in the caldera of a gigantic volcano that erupted 3.5 million years ago. It is the second largest inhabited caldera in the world after Ngorongoro. The volcano has been dormant for many, many years, but there are mud baths and thermal pools in certain areas of the caldera. Both the Canopy Lodge and the town where it is located are just delightful. When we arrive at the Lodge, it is usually hard to get to your room since visitors are hypnotized by the several colorful tanagers visiting the feeders—not to mention the very pleasant temperature. The altitude here is about 700 meters above sea level. We will arrive at the lodge by lunchtime, settle into our rooms and enjoy a delicious lunch in the open-air veranda. The air is cooler and fresh, and the feeders in the garden will be busy with bird activity—tanagers, euphonias, thrushes and honeycreepers visit the feeders regularly for fruit. Along the Guayabo River at the Lodge, Common Basilisks bask on the rocks. If disturbed, they will run across the surface of the water. Tiny Talamanca Rocket Frogs chirp during the day along the forested pathways, and they present a good challenge to locate and observe! Over at the Canopy Adventure, a short trail with suspension bridges and walkways brings us to a beautiful waterfall, El Chorro Macho. Along the trail through the epiphyte-draped forest, we will keep our eye out for frogs and anoles. Turniptail Geckos, Water Anoles and Speckled Racer are just some of the possibilities here! Over at the natural swimming pool, Beautiful Forest Frogs might be found along the edges. Back at the lodge, we will can enjoy the cool air and cocktails, and review our list of reptiles and amphibians for the trip. Dinner at CANOPY LODGE. After dinner, we will explore the grounds of the Canopy Lodge in search of frogs and other herps. Small-headed and Hourglass Treefrogs can be observed by the pond, and Red-webbed Treefrogs are a common garden visitor. Cane Toads, Beautiful Forest Frogs, Pug-nosed Treefrogs, Drab Treefrogs, Spot-shouldered Rain Frogs, White-lipped Foam Frogs and huge Savage’s Thin-toed Foam Frogs are all frequently encountered. By the far end of the pool, we occasionally see Stream Anoles and Scorpion Mud Turtles! For early birds, the feeders in the garden will be filled with ripe bananas for the birds, and fresh coffee will be ready in the dining room. After a delicious breakfast, we will head up the road to higher ground and spend the morning at Cerro Gaital National Monument, the jagged, cloud forest covered mountains seen from the Lodge! This special area, draped in moss, ferns and epiphytes, boasts a wide variety of wildlife. 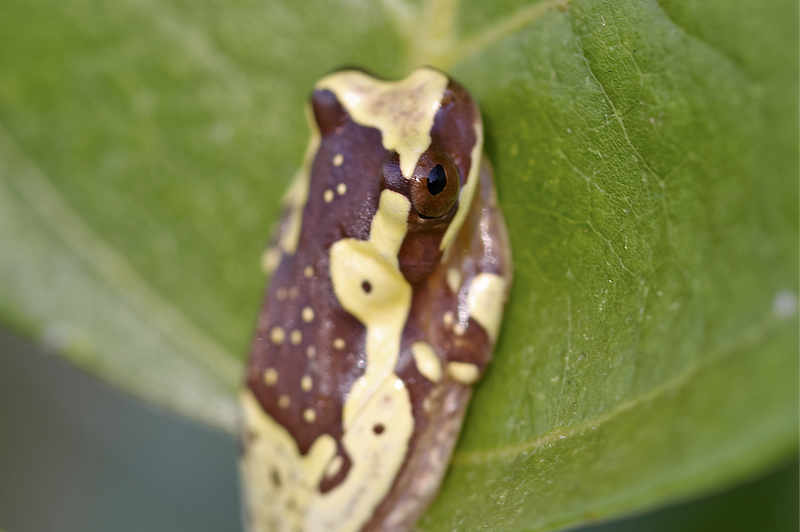 Some of the species we expect to encounter here include Eyelash Vipers near the trail entrance, Dunn’s Spiny-tailed Lizards on the banks of the trail, Masked Treefrog and more. As lunch time approaches, we will head back to the Canopy Lodge. Lunch at CANOPY LODGE. This afternoon will be a leisurely afternoon at the Lodge, and will include a fun stream walk in the Guayabo River. Among the species we hope to encounter are Climbing Toads, Parrot Snakes, Black Racers, Ground Anoles and Helmeted Iguanas! Later this afternoon, we will meet again with Steve to talk about a popular topic within the field of herpetology: unique reproductive strategies amphibians and reptiles! Dinner at CANOPY LODGE. Tonight may be our most exciting evening walk on the reptile and amphibian tour—we will head back up to Cerro Gaital, as this humid montane forest is one of the best places to find some secretive nocturnal reptiles and amphibians. 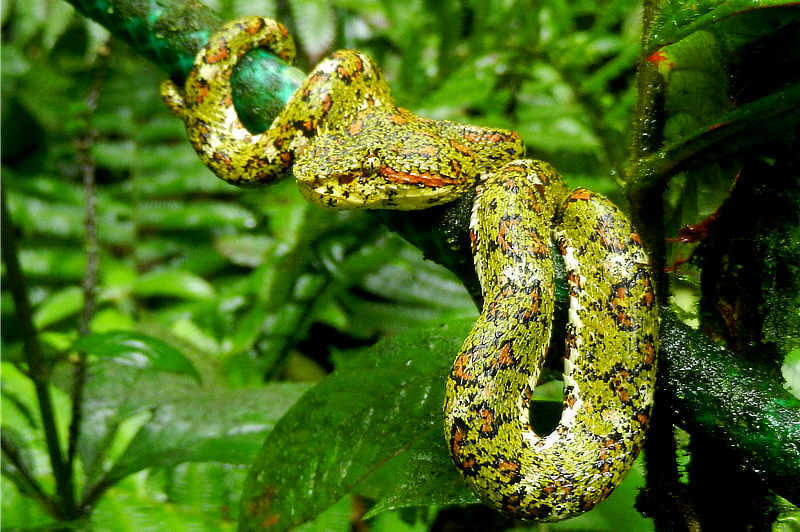 We will be on the lookout for Eyelash Pitvipers, Camaron Climbing Salamanders, Water Anoles, Blunt-headed Treesnakes, Red-eyed Treefrogs, Ilex Glass Frogs and Terciopelos! 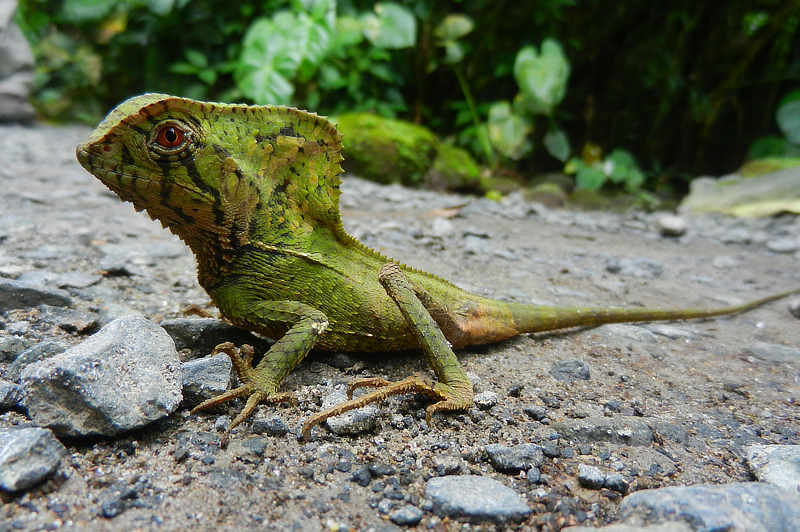 On today’s amphibian and reptile tour, we climb to our highest elevation in central Panama! Altos del Maria is a gated community tucked into the highland cloud forests east of El Valle. It is in these forests where the now extinct in the wild Panamanian Golden Frog (Atelopus zeteki) was once found.Only several years ago, this endemic species was still found here. We will concentrate most of our time along the trail and stream at Valle Bonito, the previous haunts of the Golden Frog. 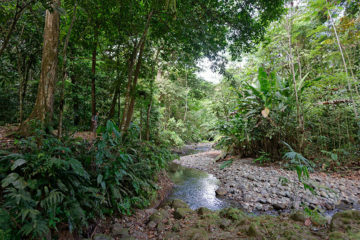 Along the tranquil trail and stream, we will look for Water Anoles, Brilliant Forest Frogs, Coral Scorpion Lizards and the endemic Panamanian Teiid. A delicious picnic lunch will be set along the banks of the little lake at Valle Bonito. After lunch, we will continue to explore another trail not far from the lake for Granular Toads, Blue-bellied Poison Dart Frogs, Clouded Snail-eating Snakes and other species. By mid-afternoon we will work our way back to the Canopy Lodge, leaving us plenty of time to rest and enjoy the gardens prior to dinner. Dinner at CANOPY LODGE. Not needing to venture far from the Lodge this evening, we will concentrate our efforts in tonight’s night walk on the stream (Rio Guayabo) that runs through the property. Walking slowly along the rocky bottom, we will keep our eyes out for frogs, toads, lizards, salamanders and snakes along the water’s edge and in the adjacent vegetation. After breakfast we will go up the hill once again to La Mesa, the matrix of winding roads and trails through lush cloud forest. Here, we will check this extensive cloudforest habitat for snakes and wildlife. After a productive morning, we will make our way back to the lodge in time for lunch. The herpetofauna activity around the lodge is also worth more exploration prior to lunch. Lunch at CANOPY LODGE. This afternoon we will round out our reptile and amphibian tour with a visit to the El Valle Amphibian Conservation Center (EVACC) located at the El Nispero Zoo. 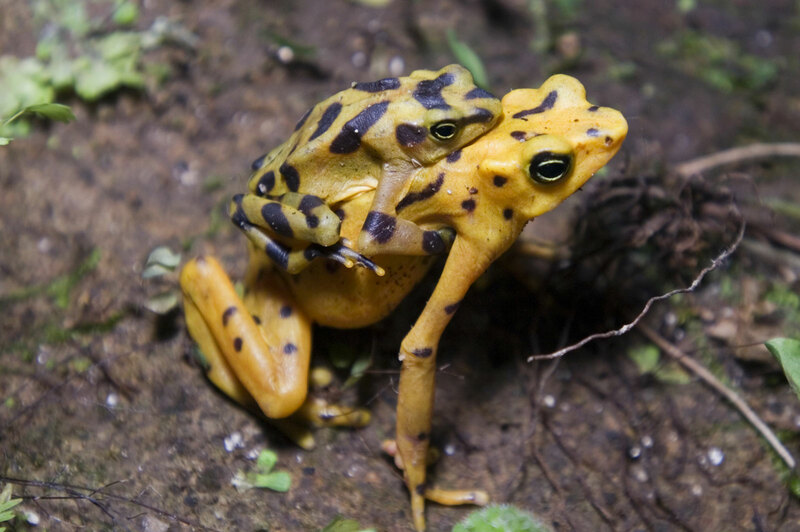 This organization focuses their efforts on saving Panamanian Golden Frogs (Atelopus zeteki) and other species at risk of extinction from habitat loss and a devastating fungus, Chytridomycosis, responsible for wiping out amphibian populations worldwide. The dedicated biologists are running a captive bred program and have been successful in breeding the Panamanian Golden Frogs (currently extinct in the wild), rearing them through all life stages, and preparing individuals for release into the wild in the near future. The center has several species, including Golden Frogs, on display and valuable information about the amphibians found in the area. After visiting the El Valle Amphibian Conservation Center, we will head over to the local El Valle Serpentarium, owned by El Valle native herpetologist Mario Urriola. The serpentarium has many species of reptiles on display, including several that are difficult to see in the wild. The facility delivers a wonderful message about conservation and living among reptiles. It will surely be an interesting and educational afternoon. Back at the Lodge, feel free to roam the gardens and stream at your own leisure. Who knows what snake, frog or lizard might be lurking around each corner! We will meet again and enjoy cocktails and appetizers, and a final presentation by Steve about tropical herpetofauna conservation. Dinner at CANOPY LODGE. This morning after a delicious breakfast we will check out and say our goodbyes to the Canopy Lodge, and head back to Panama City to catch our return flights home with great memories of this amphibian and reptile tour!